I've always thought of daiquiris as being big, slushy tropical drinks laced with coconut, pineapple and lots of rum, more often than not served with that prerequisite decoration for tropical cocktails, a tiny paper umbrella. Which may be a misperception, at least according to my 1981 reprint of the original 1946 Trader Vics Book of Food & Drink. 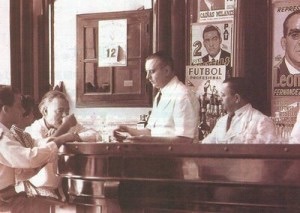 Constantino at La Florida (Hemingway is on his right). Various sources, including Trader Vic's book, lay its origin to Cuba. Not unusually in the history of cocktails, credit for creating the drink itself seems to be clouded. Wikipedia claims its inventor was "an American mining engineer named Jennings Cox, who was in Cuba at the time of the Spanish-American War" and that it was introduced to clubs in New York City by "William A. Chanler, a U.S. congressman who purchased the Santiago iron mines in 1902." From Who’s Who Havana Cuba magazine, July 14, 1938. Trader Vic's sidesteps the issue of the daiquiri's creator, but refers to "Constantino of La Florida Bar in Havana [having] perfected this one and it is to his credit that this one rum cocktail competes in popularity with the old stand-bys such as Martinis, Manhattans and Old-Fashioneds." 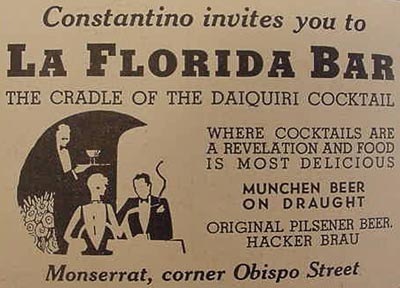 The book goes on to give four of Constantino's variations on the daiquiri, numbered 1 through 4 in turn, numbers three and four of which have instructions to "serve frappé." Though there's no mention which one Hemingway preferred, it was his favorite cocktail and legend has it that on occasion he downed a dozen in a sitting. It then gives a recipe for the Trader Vic's daiquiri, which bears the special insignia of a tiny palm tree with a T on one side of the trunk and a V on the other. The front of the book quaintly states that "recipes so marked are original and may not be reprinted without permission from the author." So, much as I would love to share it, I won't. Luckily for all of us, though, like Constantino, my husband Dave has created his own version of the daiquiri. 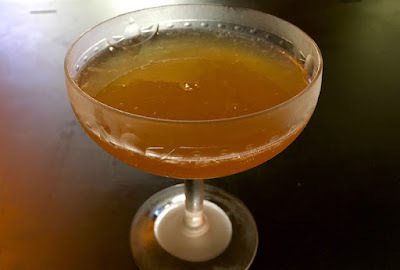 A classic three-ingredients cocktail, it substitutes dark rum—we prefer Mount Gay over Bacardi or Myers's—for the usual light rum and uses demerara sugar for the simple syrup rather than cane sugar. Shake one up and see if you don't agree with Papa that it makes other people much more interesting. Shake with ice; strain into cocktail glass or coupe. You should try Black Seal dark rum—t’s my favorite and is becoming more widely available! I make peach daiquiris every summer—works with a lot of summer fruit!